If you have a standing desk, you should probably consider a good standing desk mat. 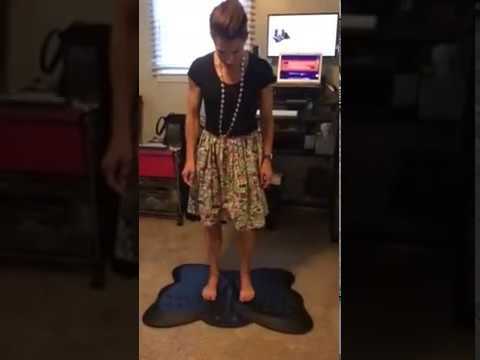 What sets standing desk mats apart from normal mats like kitchen mats are the different types of bumps, ridges, and other stuff added to give you more ways to move your weight and body around. This standing desk mat has a cute butterfly shape with balls of different heights and sizes. I’m not a huge fan of the butterfly shape. I love butterflies but probably wouldn’t want to stand on one all day long. It is compact enough to fit under most desks so you shouldn’t have a problem with the width of this mat. This mat has a central large ball they call a teardrop. My current mat has one too and this area is useful for moving your ankles around quite a bit. The edges are beveled so they shouldn’t curl over and create a tripping hazard. Overall, butterflies are your thing, this is definitely a good standing mat. It will become a conversation starter in your office or wherever you use this mat. Check on the latest pricing for the Butterfly Ergonomic Non-Flat Anti Fatigue Standing Desk Mat.